With GIS, disparate data is collected and transformed into China's national data standard. The Changjiang (or Yangtze) River meanders 3,915 miles through China, from the glaciers in Tibet to the East China Sea. Since opening the river to foreign trade 30 years ago, China's shipping industry on the Changjiang River has grown by leaps and bounds. In 2011, freight volume exceeded 1.6 billion tons, making it one of the largest and busiest transport rivers in the world. Increasingly, electronic navigation devices are being used instead of paper charts to keep up with the rise in vessels on the waterway. The Changjiang River is managed by the Changjiang Waterway Bureau, part of China's Ministry of Transport. The bureau is responsible for waterway planning, construction, management, conservation, and waterway administration on the river. The bureau's cartographers and chart makers use ArcGIS to create standardized Electronic Navigation Charts (ENCs). These charts are a vector database of the marine environment, comprising the shape of the coast; the river bottom, including depths; and the location of navigational aids along the river. More than 10,000 people work in the bureau, many charting and mapping hundreds of miles of the river and approximately 5,300 navigating markers, such as beacons and buoys, that allow ships to safely sail. Staff members are spread throughout 77 waterway management departments, ensuring that the data is collected as close to the source as possible, increasing its accuracy. The Changjiang Waterway Bureau has developed its own local river ENC chart standard—CJ-57—based on the maritime industry's international S-57 standard. These standards are developed to ensure digital data can be transferred from one system to another without jeopardizing the integrity of the data. Since the GIS data model is based on the industry standard, bureau staff can maintain the local data standard when it is stored in the geodatabase. Le Xu, the ENC production technical leader, explains that the GIS and its extensible data model, objects, and attributes make meeting Changjiang standard characteristics easy, paving the way for the bureau's ENC production. All the source data editing and modification is now centralized in the bureau's geodatabase and shared over the internal network. The end result is the ability to export seamless maps from a single database. Having a centralized geodatabase has also improved the quality of the data and cartography by reducing the inconsistencies that occurred when the maps and cells were edited individually in silos. When multiple datasets must be edited at the same time, the map tile or chart cell is first divided into continuous stream segments, or river reaches, in the main geodatabase. Then, each version is divided into different versions: contours and soundings, riverbanks, and other objects. The advantage to this workflow is the ability to modify the data without affecting another editor's edit. As traffic increases, so does the risk of water accidents and loss of economic opportunities. Ensuring water traffic safety on the Changjiang River is essential to the health of the river and the national economy. Creating one unified nautical information system is helping China increase trade along its "golden waterway." 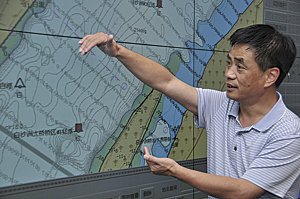 "By implementing GIS," says Shuo Xu, the ENC production team leader, "the waterway authority has improved the extensibility of the system; achieved the functionality required by the ENCs to achieve multiscale, distributed ENC production; and improved the efficiency and quality of the system."